CF-ZYL early in her career. C-FZYL at Toronto / Buttonville - CYKZ, Ontario. N62355 on delivery, at Edmonton Municipal Airport - CYXD, Edmonton, Alberta. N338AK arriving back at Juneau, Alaska. N338AK backs into parking spot at Juneau. • CR-LDA Petrofina SA., of Luanda, Angola, Portuguese West Africa. Regd 26th June 1958. • CR-LDA Compagnie de Petroleos de Angola, Luanda, Portuguese West Africa. Date unknown. Note Also quoted as being with Missao de Pesquisas (West Africa). • CF-ZYL Bannock Aerospace Ltd., Toronto, ON., Feb-1971. • CF-ZYL Airexec Services Ltd., Fort St John, BC., on lease. Regd Jun-1971. • CF-ZYL Bannock Aerospace Ltd.,Toronto, ON. • CF-ZYL Newfoundland & Labrador Air Transport Ltd (NLAT) of Corner Brook, NL. Based South Brook & Deer Lake. • C-FZYL Re- registered to Newfoundland & Labrador Air Transport Ltd (NLAT) of Corner Brook, NL. • C-FZYL Labrador Airways (Air Labrador), Goose Bay, NL. Jan-1977. Accident: Mary's Harbour, NL. 18-May-1984. Main gear collapsed on landing. Repaired and returned to service. • C-FZYL Transferred to Labrador Aviation Services Ltd., Goose Bay, NL., 18-May-1988. Continued operating with the Labrador Airways fleet. Canx 23-Dec-1988. Ken Wilson Aircraft Sales Ltd., Esteem Holdings Ltd., Markham, ON. Regd Jan-1989. Note: Shown on CCAR as Esteem Holdings, Ltd.
• N62355 Kenneth R. Ward, dba Ward Air, of Juneau, Alaska, Regd Jul-1990. • N62355 Alaska Juneau Aeronautics Inc, dba as Wings of Alaska, Juneau, AK. Regd Mar-1993. • N338AK re-registered to Alaska Juneau Aeronautics Inc., Juneau, AK. • N338AK Alaska Coastal Airlines Inc., Juneau, AK. Continued to fly with Wings of Alaska. Regd Apr- 2002. Power plant: Texas Turbine conversion (conversion # 14) with the Garrett TPE-331 engine. Winter 2004/5. Carried out by Kal-Air after being “de winged” and shipped in a crate to Vernon, BC. Otter 262 was delivered to Petrofina S.A. of Angola (then the colony of Portuguese West Africa) on 26 June 1958, registered CR-LDA. It was crated and shipped to Luanda, where it was re-assembled and entered service, providing transportation to the oil company’s personnel around Angola. It was later registered to Compagnie de Petroleos de Angola, still based at Luanda. Its colour scheme was white upper fuselage and tail, dark blue cheatline and lighter blue lower fuselage. 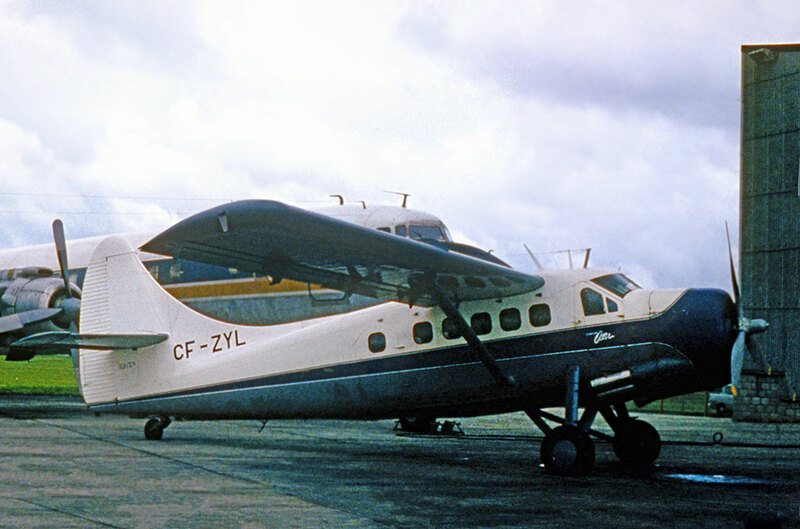 Having served the oil industry in Angola for twelve years the Otter was purchased by Bannock Aerospace Ltd., of Toronto, Ontario in February 1971 and marks CF-ZYL allocated prior to the very long ferry flight from Luanda to Toronto. The Otter arrived in Shannon, Ireland on 30 April 1971, where ferry tanks were installed for the ocean crossing. The pilot teamed up with another ferry pilot who was ferrying a BN Islander CF-ZVV, which had also been tanked in Shannon. On 8 May 1971 both aircraft set off for Reykjavik. They were monitored on HF radio, the Otter at 6,000 feet and the Islander at 8,000 feet by 60 North at 12:50, estimating 61 North 1640 West at 13:29, relaying via a Canadian Pacific Airlines “Empress” flight. They continued on via Greenland and Newfoundland, the Otter eventually arriving in Toronto. After overhaul ZYL was leased by Bannock Aerospace to Airexec Services Ltd., of Fort St.John, BC in June 1971. In March 1972 it went on lease to Yukon Airways of Whitehorse and on 2 June 1972 it was sold to Newfoundland & Labrador Air Transport Ltd (NLAT) of Corner Brook, Newfoundland, later re-registered C-FZYL, where it was joined by Otter C-GNLA (424). NLAT flew the Otters from South Brook, Newfoundland on floats during the summer and out of Deer Lake in winter. In April 1974 NLAT became a subsidiary of Labrador Airways Ltd of Goose Bay. In January 1977 NLAT was sold off by Labrador Airways but the two Otters were retained and became part of Labrador Airways large fleet of Otters. That month ZYL was registered to Labrador Airways Ltd., and painted into its colours of red overall with white cheatline and white flash on the tail. A nice touch was painting the propeller yellow and black. At that stage Labrador Airways had a fleet of ten Otters flying its scheduled services and charters out of Goose Bay, serving the coastal communities. 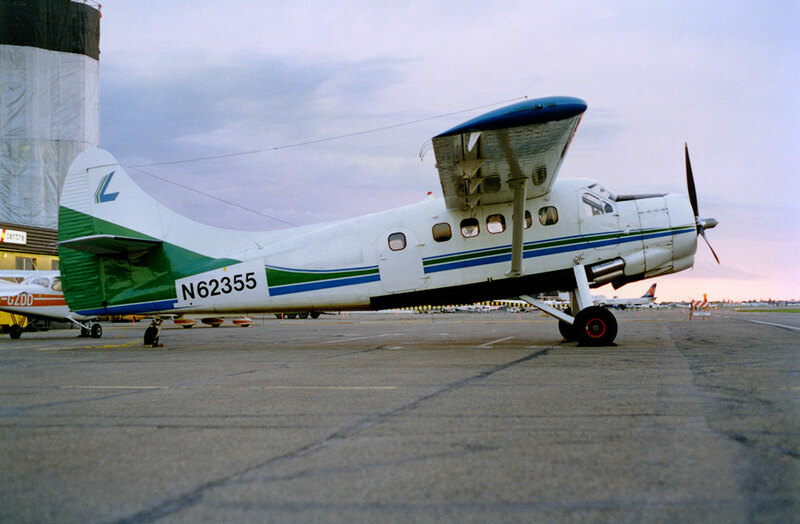 Over the years that followed Labrador Airways reduced its fleet of Single Otters, as they were replaced by DHC-6 Twin Otters. By 1982 all the Single Otters had been sold, apart from ZYL which was retained by Labrador Airways for charter work out of Goose Bay. An incident was recorded on 18 May 1984 when the main gear collapsed on landing at Mary’s Harbour, Newfoundland. The Otter was repaired and returned to service. In May 1987 Labrador Airways acquired Goose Bay Air Services as a subsidiary, which at that time operated three Otters. ZYL was assigned to the Goose Bay Air Services fleet and painted in their green and blue colours and continued its charter work out of Goose Bay. In May 1988 ZYL was registered to Labrador Aviation Services Ltd but continued flying for Goose Bay Air Services. This continued until December 1988 when it was flown south to the Buttonville Airport, Toronto. Its registration was cancelled on 23 December 1988 and it was put up for sale. It was registered briefly to Esteem Holdings Ltd., Buttonville from 23 December 1988 to 30 January 1989. The Otter remained parked at Buttonville Airport until it was sold. In January 1989 it was registered to Ken Wilson Aircraft Sales Ltd., of Toronto. It was eventually sold in July 1990 to Kenneth R. Ward, trading as Ward Air of Juneau, Alaska to whom it was registered that month as N62355. It was photographed at Buttonville on 19 July 1990 still in its Goose Bay Air Services scheme but now carrying marks N62355, about to depart for Alaska. It was flown all the way from Toronto to Juneau on wheels by Ken Ward. Its floats were shipped via truck and then barge to Juneau and N62355 became a floatplane, flying as such from Juneau on general charter work. There were also two Beavers and a Cessna 185 in the Ward Air fleet. 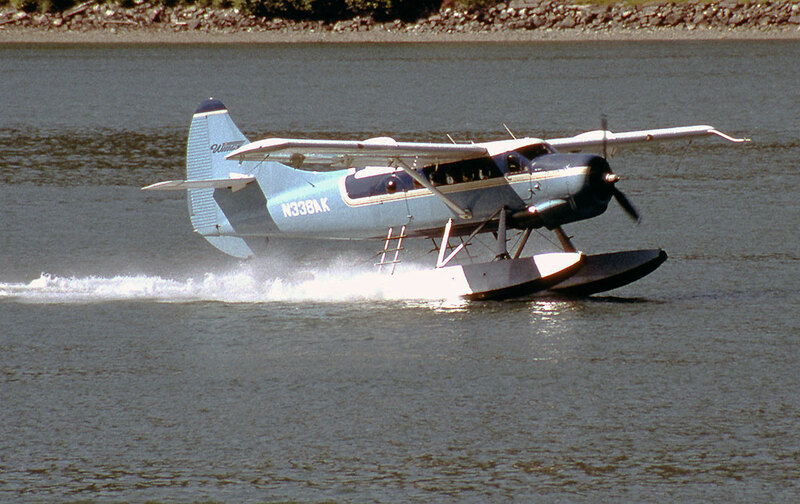 The Otter continued flying for Ward Air until March 1993 when it was sold to Alaska Juneau Aeronautics Inc, trading as “Wings of Alaska”, also based at Juneau. This carrier operated scheduled and charter flights out of Juneau, catering in particular for the cruise ship passengers who call into Juneau during the summer months. 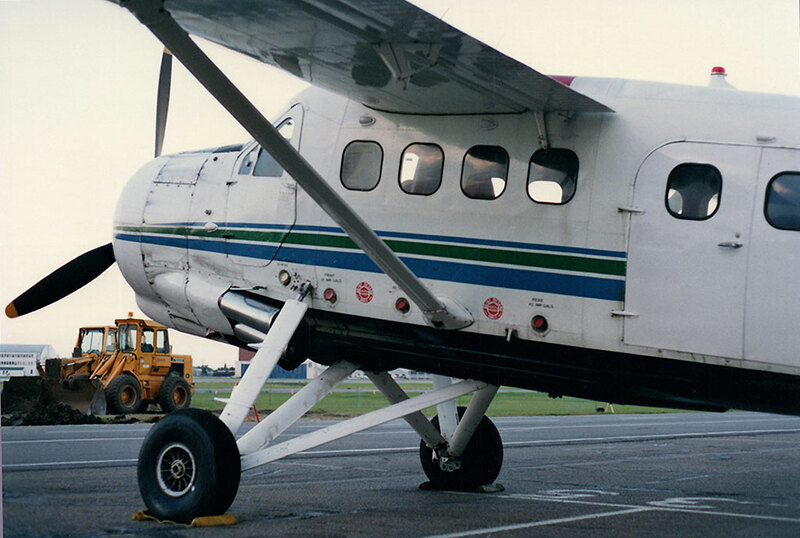 In April 1997 the Otter was re-registered N338AK, in the course of a re-paint with Victoria Air Maintenance at their facility at Victoria on Vancouver Island. 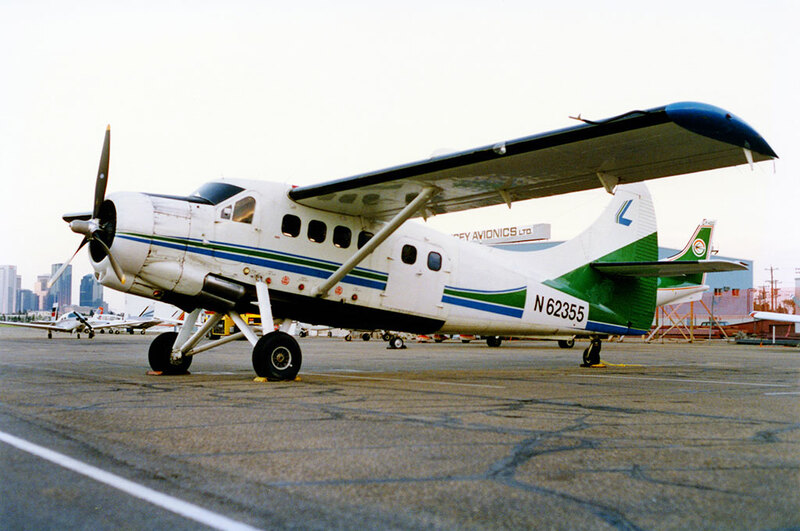 On 25 April 2002 the Otter was sold to Alaska Coastal Airlines Inc, a company formed by a group of employees of Alaska Juneau Aeronautics and it continued to fly from Juneau as part of the Wings of Alaska fleet. 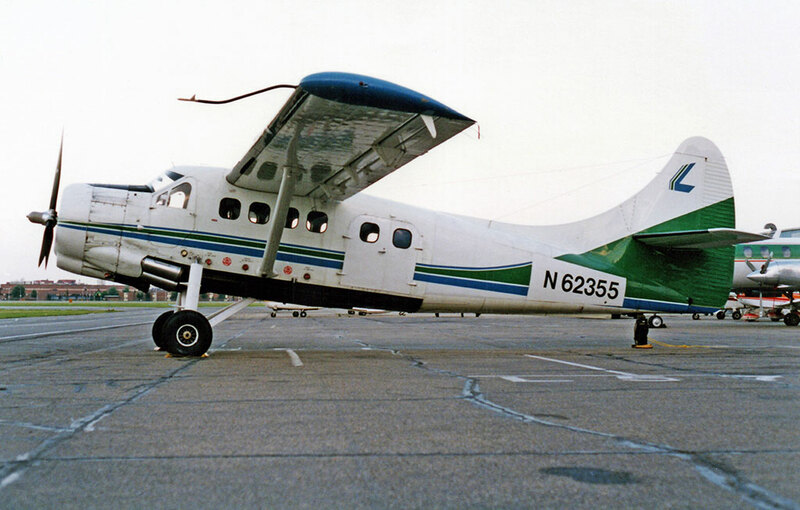 During 2004 Wings of Alaska arranged to convert its Otter fleet to the Texas Turbine conversion, with the Garrett TPE-331 engine. Some of this work was carried out at the company’s Juneau base, where personnel from Texas Turbine attended to assist. 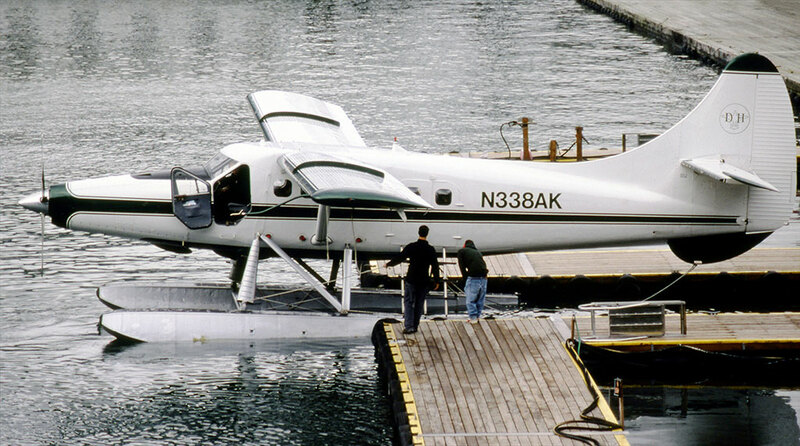 In the case of N338AK, its wings and piston engine were removed at Juneau and it was shipped in a crate (along with N339AK, serial 454) to Vernon, BC where both Otters arrived mid October 2004. Here Kal Air carried out the actual installing of the turbine engine before N338AK was shipped back to Juneau early March 2005, where the conversion work was completed. It re-entered service for summer 2005 as a turbine Otter, painted in Wings of Alaska new colour scheme. The four Texas Turbine Otters (N336AK, N337AK, N338AK and N339AK) were re-registered to Wings Airways Ltd on 27 October 2008, the company from then on being known as Wings Airways. They were again re-registered on 18 January 2012 to IPA Leasing Inc, Juneau (IPA standing for Inside Passage Aviation) but were immediately leased to and continued in operation with Wings Airways. As of summer 2017 N338AK continued in service with Wings Airways, flying the cruise ship passengers on sightseeing flights out of Juneau.